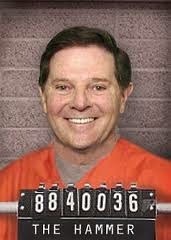 If you tried to find out what recently happened in court ending the criminal case against former GOP Congressman Tom DeLay, almost all the results that come up are from conservative sites. The left-wing news media deliberately ignored the story of his total legal exoneration earlier this month. Contrast this with the multiple, lengthy front-page articles than ran for years gleefully covering the progression of the politically motivated attacks on him. I saved an article taking up the top half of the front page of The New York Times from 2006 - with a huge photo of DeLay high-fiving my cousin, a Congressional staffer - announcing that DeLay was being forced to leave Congress due to the indictment. In contrast, the Times printed a tiny, three-sentence paragraph about the exoneration that was buried in the print edition on page A20. When DeLay was indicted in 2005, most people around the country did not understand how politically motivated the left-wing Travis County District Attorney was. Now that sitting Texas Governor Rick Perry is being prosecuted by current DA Rosemary Lehmberg, a convicted drunk driver, the targeting by that Democrat-controlled office is finally coming to light. The Austin-based office badly overstretched going after the popular governor, and now its history of corrupt prosecutions are all coming to light.